Minutes from Port Everglades cruise terminals and offering free shuttle service to Fort Lauderdale International Airport, this Florida hotel features an on-site outdoor pool. Located just off Interstate 95, the Rodeway Inn & Suites Fort Lauderdale Airport & Cruise Port is minutes from the Hard Rock Cafe and beautiful beaches. Guests can also easily discover a number of shopping centers, restaurants and golf courses nearby. While staying at the Fort Lauderdale Airport & Cruise Port Rodeway Inn & Suites, guests can enjoy American cuisine at the hotel's restaurant. 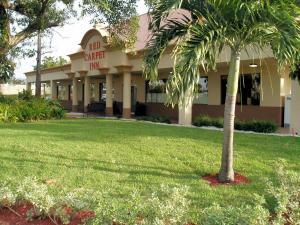 The pet-friendly hotel also offers a business center and car rentals. 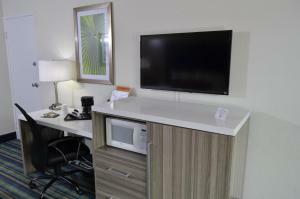 When would you like to stay at Rodeway Inn & Suites Fort Lauderdale Airport & Cruise Port ? This room features a cable TV and work desk. Guests are required to show a photo identification and credit card upon check-in. Please note that all Special Requests are subject to availability and additional charges may apply. Please inform Rodeway Inn & Suites Fort Lauderdale Airport & Cruise Port in advance of your expected arrival time. You can use the Special Requests box when booking, or contact the property directly with the contact details provided in your confirmation. Each day we'll check prices and send you an email for your selected dates at Rodeway Inn & Suites Fort Lauderdale Airport & Cruise Port. If you don't have specific dates but would like to check prices for say next weekend or say next month we can check the price too. Click to write a review and share your experience of Rodeway Inn & Suites Fort Lauderdale Airport & Cruise Port with other travellers.